@nd4reality wrote: @Aunties_Love following and followers numbers changed? Those stats where taken when his account was still public or when @Aunties_Love already followed him so it is not really helpful. He and Cameron where actually found even before we knew Hannah was going to be the lead, so a lot of people followed both even before. We know he was still there with the week one of dates. Since filming his follow count has stayed at 440 and the followers right now 4668 but that has been up and down by a few. Those that followed before would report any significant activity. @smg2587 OK. A bit confusing but I guess you guess are checking multiple times daily. I saw the # of following was down by 10 so thought to mention it. More eliminated contestants should have surfaced by now I would have though. Thanks for all you do. 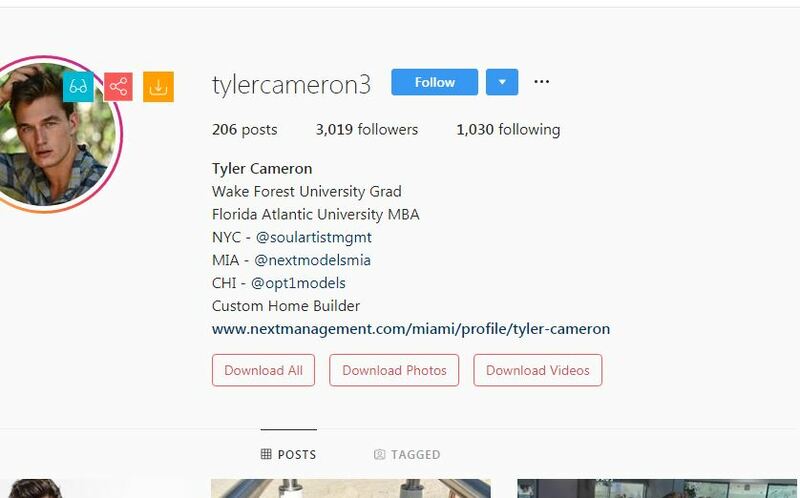 From the previous paged posted Feb 25th, to today, he increased his followers by over a 1000 and from the time that @Opal sleuthed him on Feb 25th to Mar 12 when revealed by RS, he cleaned up his followers by over 600. When revealed by RS, (@Aunties_Love posted his IG Mar 12th) he was still public. Sometime after Mar 12th he went private. My point is IG will be the first place he goes when he's eliminated. SO do y’all Think he’s out ? He hasn't responded to my follow request and his IG is still listed as private. I read some info on him. On a friend's instagram they talk about spending a day volunteering with a group of NYC school kids. One kid was struggling and Tyler took him aside, talked him down and later hailed the boy as a hero to the group per his friend. Looks like superman and acts like it also! @nd4reality wrote: Looks like superman and acts like it also! Lol, At the very least, maybe more than just a pretty face. At the very least he made a difference in one boys day and by association, possibly life. Not saying it means anything BUT....he has 22 less followers and is following 2 more on a private acct. When was the rose ceremony?